Aerial view of Christkindlmarkt (Christmas Markets) in Marienplatz outside Neues Rathaus in Munich. 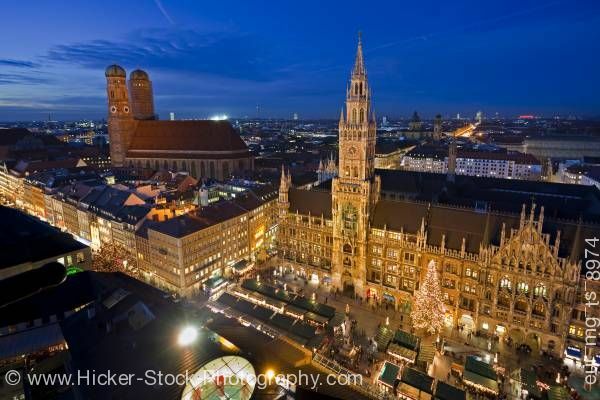 This stock photo shows a wonderful evening aerial view of the Christkindlmarkt (Christmas Markets) in the Marienplatz outside the Neues Rathaus (New City Hall) with the Frauenkirche, aka Domkirche zu Unserer Lieben Frau, (Cathedral of our Blessed Lady) in the background in the City of Mnchen (Munich), Bavaria, Germany, Europe. An evening aerial view reveals the distinct Gothic Revival architecture of the Neues Rathaus along with the simple lines of the Frauenkirche’s Gothic style. The city hall building is a wonderful backdrop for the Christmas market. The Neues Rathaus is ornate which stands out among Munich’s beautiful city. A brightly Christmas tree stands by the Christmas market. Aerial view of the Christkindlmarkt (Christmas Markets) in the Marienplatz outside the Neues Rathaus (New City Hall) with the Frauenkirche, aka Domkirche zu Unserer Lieben Frau, (Cathedral of our Blessed Lady) in the background at dusk in the City of Mnchen (Munich), Bavaria, Germany, Europe.